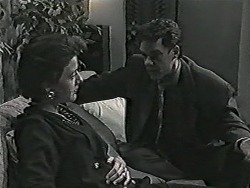 Harold tells Robyn he can't see her anymore. Gail receives a criminal conviction for shoplifting. Jane is trying to reason with Des about the cosmetic company attending their wedding. Des isn't convinced though, saying the company will turn the wedding into a circus. Jane suggests that she could use her savings for the wedding instead, but Des doesn't like that idea either. Jane is getting crosser and crosser. 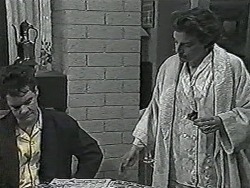 There's a knock at the door and it's Harold, who can't wait to tell Des and Jane that Bronwyn and Henry are engaged. They are astounded to hear this, but very pleased, saying it explains why Mike has been stomping around like a bear with a sore head! 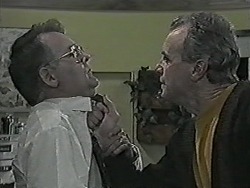 Harold says that Mike tried to confuse poor Bronwyn, but it's all turned out right in the end. When Harold is gone, Jane comments sarcastically to Des that it's nice that some couples can sort out their problems! Gail is very angry about the conviction and says that Paul should have let her plead guilty. Paul says it'll be fine - noone will know outside their immediate friends and family. Gail is worried that Hilary will find out and not want to invest in Lassiter's anymore. Hilary is telling Matt off again about the cheating at school. She doesn't want Matt seeing Nick anymore, and she's avoiding the Robinsons as well. She thinks they're better off on their own. Jim is ranting about Gail's conviction - he thinks it's very unfair. Todd is ready for school early and is looking a bit shifty. Helen asks why Todd is wearing a skivvy with a high neck and he says that he's cold. Jim asks how Todd's first date with Melissa was and he is a bit evasive, saying it was OK. He heads off to school. Helen tells Todd to come home for lunch. 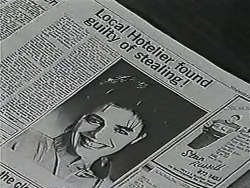 Paul opens the local paper and sees a large photo of Gail with a report about the conviction, "Local Hotelier Convicted Of Stealing!". 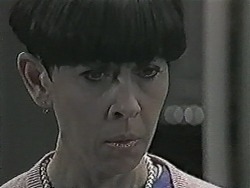 Gail is horrified - now everyone in Erinsborough will know. Helen harrasses Jim about the contents of his suitcase(!) but Jim teases her that there are some things people are better off not knowing! Matt comes in looking for Nick to walk to school, but he's already left. Matt is keen to make things up with Nick - he's sorry for the trouble over the cheating. Jim says that Hilary is the one making things difficult for Paul and Gail at the moment, especially in light of the court case. This is news to Matt and he asks what's happened. Paul is telling Jane and Gail that they can't afford an image problem for the hotel. He has a solution but Gail won't like it - Gail will have to resign and Jane will take over. Jane says she doesn't want the job on a permanent basis. Gail is upset - it's like admitting guilt, but she finally agrees. Des is filling in for Bronwyn at the Coffee Shop and chatting about the weddings (Kerry and Joe's and Des and Jane's). 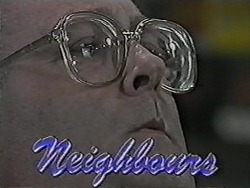 Harold answers the phone to the vicar and says that he'll drop his article around to the Rectory as soon as possible. He also tells him that his "friend" has resolved his issue with his lady-friend. Jim, Helen and Todd are having lunch. Todd has to take his shirt off and soon it's revealed exactly why - he has a love bite on his neck! Jim tells Todd that they'd better have a bit of a talk this afternoon. Todd cringes. Helen starts banging on about the suitcase again, so Jim marches her over to it and opens it. It's full of rocks! - apparently Jim has a dormant fascination with geology. Helen isn't impressed at all. Matt is doing his homework at the kitchen table when Hilary comes in. He's been writing a letter but quickly covers it up. As he gets up to leave, he accidentally drops the letter. Hilary reads the letter and it's a letter Matt has written to his adoptive parents. He says he wishes he could get along with Hilary as he used to with them. He says that she's got no real friends and fights with all her relatives. He feels disappointed that she's his mother. Hilary is cleaning when Matt comes in from school. 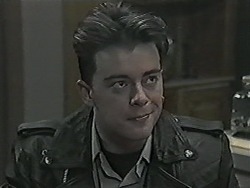 He says Nick is still avoiding him, and says he can't blame him what with Hilary blanking Paul and Gail. Matt tells Hilary about the shoplifting incident. She is surprised and tells Matt that she's shocked, but sympathetic. Matt is a bit incredulous at this sudden turnaround in attitude, but Hilary says that Paul and Gail are her family after all. She says the Robinsons stick together in times of trouble - she may say things in the heat of the moment, but she does love her family. Matt says that Hilary is full of surprises. Harold congratulates Jane on her promotion to Manager. She goes into the kitchen to speak to Des. Jane asks Des about the wedding again. She says she wants to go with the cosmetics company for the wedding. Des apologises, but Jane is upset. She says that she may not be Daphne, but she does understand some things. Paul is drafting Gail's letter of resignation. He answers the phone to Hilary. He's amazed when she tells him that she's decided to invest in Lassiter's after all! Apparently she thinks that Gail's conviction was a gross miscarriage of justice. Paul and Gail hug. Jim is giving Todd "the talk" saying that it would be easy to do something now that would cause himself and others a lot of pain. He shouldn't get too intense too soon. Todd says he understands and Jim doesn't have to worry. 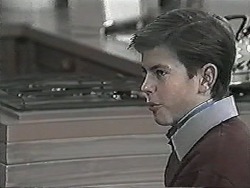 JIM: If you say one word against Gail - to anyone - so help me, I'll make you sorry. And if you don't think I mean it - try me!